The Beantown Bloggery: Cheap Ryanair Flights to Europe On The Way? This is pretty exciting news. I've never been to Europe, or rather I should say I haven't been to Europe YET, so this definitely piqued my interest. The budget airline Ryanair plans to offer trans-Atlantic flights as cheap as $12.70, before taxes, to Boston and several other US locations from Britain and Ireland, a company official said, according to a newspaper report. "Economy class will be very cheap - around 10 euros [$12.70]. But our business class will be very expensive. There's always 10 to 15 percent who'll pay whatever it costs for a wide seat," O'Leary was quoted as saying. I hope Ryanair follows through with their plan. I'd love to check out London. I have several friends that are out there working, so I'd love to visit them for less than the price of a bus ticket to NYC. PS. 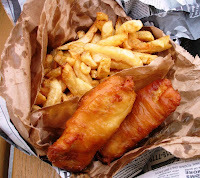 Now I have a craving for fish & chips. 0 Response to "Cheap Ryanair Flights to Europe On The Way?"